I WAS DISAPPOINTED for Roy Keane when he was dismissed as Ipswich Town manager last week, and I know Roy will be, too. Roy was my captain for many years at Manchester United. He was a great, great player, a driven and passionate man who gives 100% in whatever he does. He never, ever, shirked responsibility, protected his teammates and could be his own biggest critic. Of course he was doing it because he was brilliant; that is why he was captain of Manchester United. Winning was everything. He was a hard man and ultra-competitive. He always ended up taking Quinton Fortune, the South African midfielder, out with ferocious tackles. The gaffer [Sir Alex Ferguson] saw one on a pre-season training camp and came over, telling Roy to calm down. Roy told him to keep his oar out. The manager abandoned training. The lads couldn’t believe what they were seeing. I had a good relationship with Roy, but not every player did. We didn’t have a cross word. He knew my character and I knew his. I called him Schiz, short for schizophrenic, and got away with it, so he must have liked me. Roy took those values into management and I know because he took me to Sunderland, his first management job. He expected everything from his players and set standards similar to his own as a player. The problem was that none of the players were anything like as good as Roy had been. He was a hard manager, too. But management is different to playing. You have to change. 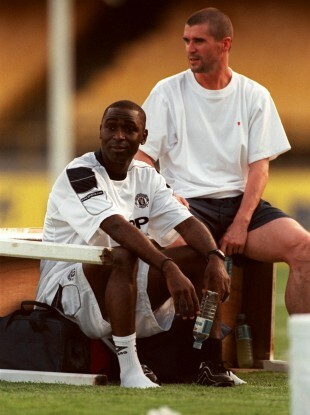 Email “Andrew Cole column: Don't write off my old friend Roy Keane, despite failure at Ipswich”. Feedback on “Andrew Cole column: Don't write off my old friend Roy Keane, despite failure at Ipswich”.